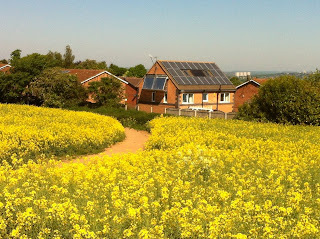 27 May 2012: Sunday, it's my son's birthday, and it's the sixth day in succession of heatwave weather, with more to come. Being slightly colder in the morning with a sunny morning, we had the highest PV of the year, exceeding the 30th April. 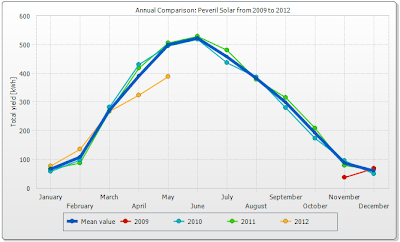 April 2012 was a terrible month for PV with a score a full 100kWh lower than with April 2011, and if it hadn't been for that day, the difference would have been a deficit of 120kWh. 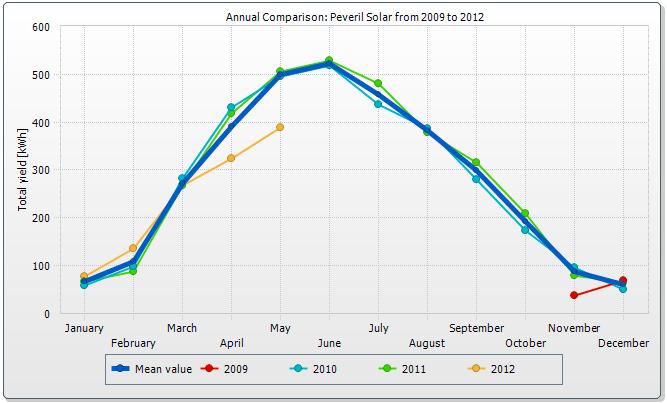 Even with the brilliant weather of the last week, PV score for May 2012 is also looking to be much lower than May 2011. Our May average has been 500, and today it is still below 400. In this graph, three years are compared. 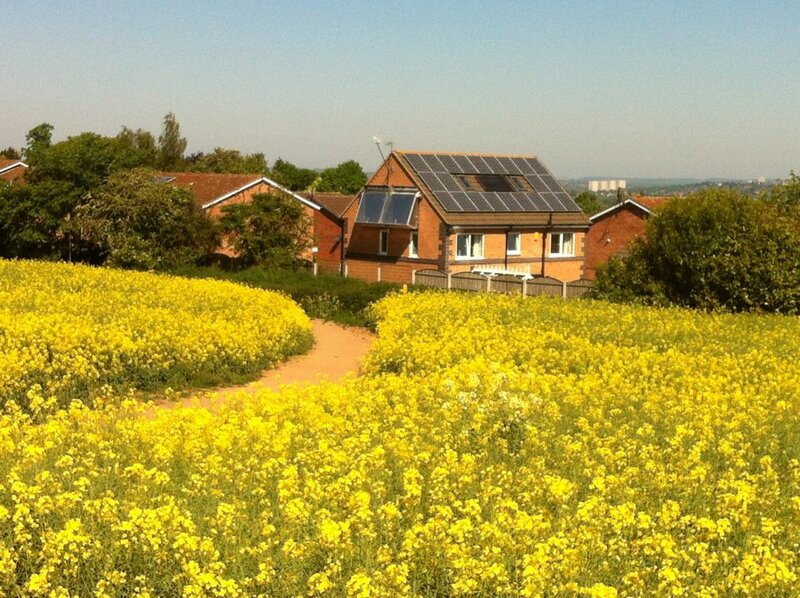 View of Peveril Solar house from the path leading up to Sharphill. The house is on the edge of the green belt, so we see the crops being sown and later being harvested - sometimes at night making me think that the tractors must work with GPS, since the furrows are so perfectly parallel. The house is current in a sea of brilliant yellow! 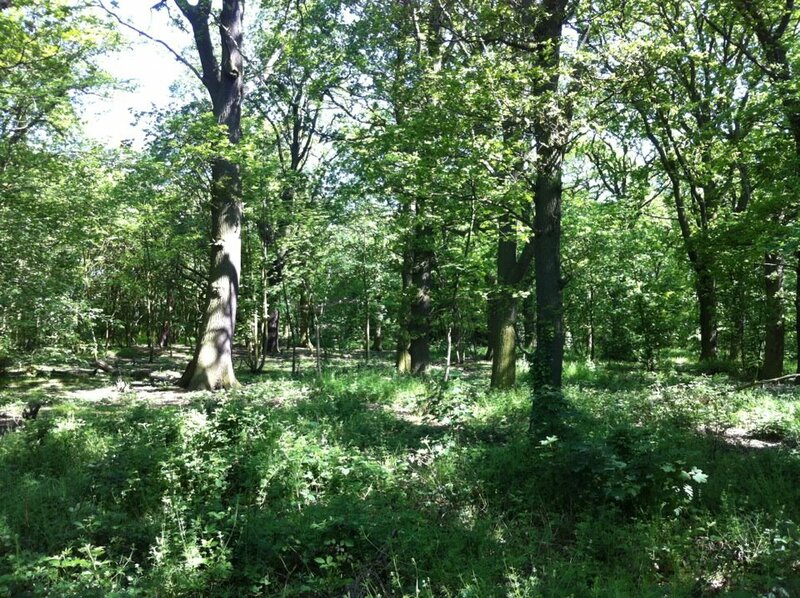 Sharphill wood is a peaceful little forest of indigenous deciduous trees that is well maintained by the 'Friends' group. 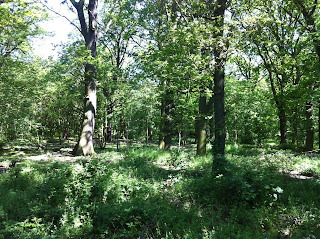 This is about the right density for a native woodland in the Nottinghamshire region. Later we went to the Derbyshire Food and Drink festival at Hardwick Hall and I managed to get some gardening done in the evening! I think I might have to mention gardening here more often, it would make a break from all this plumbing! I need somewhere to store maps of what has been planted. Airstream caravan coffee shop at the Derbyshire Food and Drink Festival. 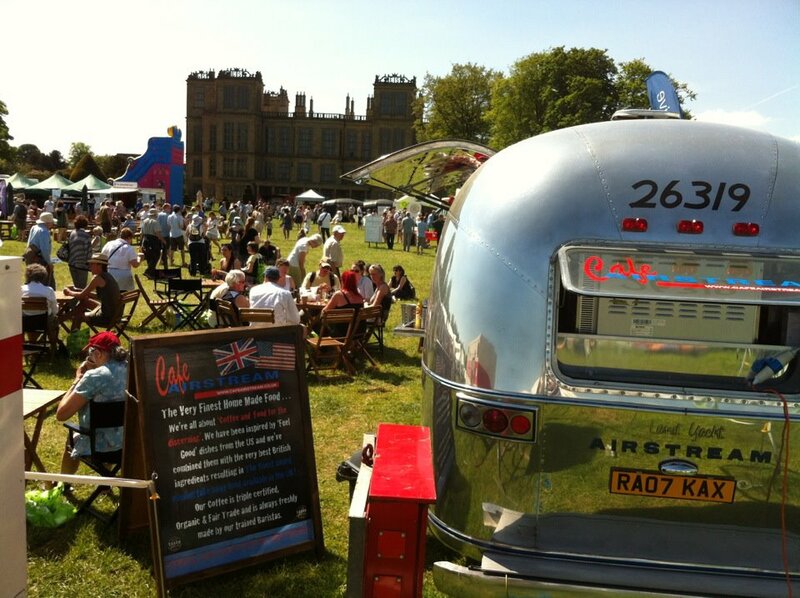 I can't work out where the money goes to at places like this!